10th: Fusion Food – Take two cuisines and make them work together. When Fusion is the goal, I know where to turn. My copy of Fusion Food in the Vegan Kitchen bu Joni Marie Newman will not steer me wrong! I was flicking through it (there are so many yummy things), and the recipe for Not-Chows caught my eye. Nachos, but with an Asian twist to the toppings. 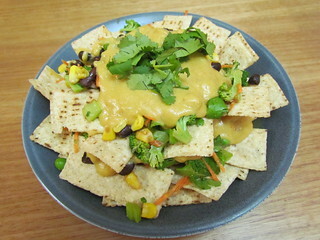 Not-Chows: Take tortilla chips, and layer them with a refreshing bean and veggie mix and a miso mustard cheese sauce. Sounds pretty great to me! The bean mix has black beans, carrots, peas, corn, broccoli (I blanched it), scallions and fresh coriander, and I added in some celery rather than capsicum or crunch. It makes a nice counterpoint to the very rich cheese sauce. The cheese sauce is coconut milk based, and I used a blend of light coconut milk and oat milk, though it was still a bit too coconut-fatty for me. Next time I would make it with a thick soy milk. The bean mixture is tossed with a light dressing, and I would recommend draining it before topping the chips with it. The dressing pooled on the bottom of the plate and the lower chips got a bit soggy. Oh, I left out the jalapeno as well, so it was spice free. What would your fun fusion nacho topping be? Today we meet spunky little Max again, my second kitty of only six weeks. 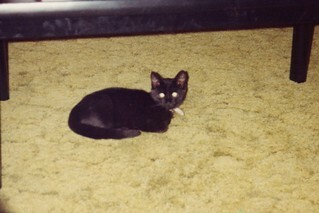 Here is a photo of him hiding under the coffee table. Yum! I have that book and haven't pulled it down in awhile. Need to make these! I'm craving something carby and comforting to help me through these tough times. Oooh nice! Sorry the sauce wasn't so great for you. I don't think your food is boring! I did enjoy the veggies on the nachos, it made them practically health food! I think I've seen a "vietnamese" nacho before. I don't think it had any cheese, but a peanut sauce over the chips with fresh herbs and veggies and stuff that you would put on pad thai.